The long-awaited and never-before-seen test is finally up and public for showcasing. This is an ‘extremely’ buggy playground test of REGT’s SimpleX Vehicle Physics, as discussed on Discord in late 2017. 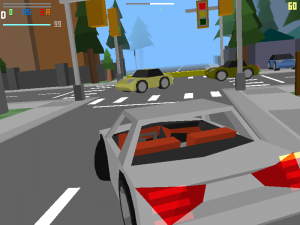 Roam a distorted and unfinished low-poly town, discover 001 vehicle physics, and experience a first-ever City Traffic AI system in live action. If you have any questions, please reach out in Discord via chat. NOTE: To start the vehicle, hold down the brake key before turning the ignition – this is required when changing transmission modes as well. To turn ignition off, set vehicle to park or set to first gear.